When we saw the Bondtech extruder at the last MRRF, it was a device that could push a lot of filament very hard; the promise of two knurled or hobbed gears pushing filament through a hot end was very interesting. Here’s a video showing the Bondtech extruder pulling filament with 20 kilos of force. This year, [Martin] was back in Indiana showing off his newest version of the Bondtech extruder. Where the old Bondtech extruder required you to send commands to the stepper motor to change the filament, the new QR version (quick release) includes a lever to lock the filament in place. While this isn’t a big change to the Bondtech extruder, it does make a great extruder even better. There were a number of RepRaps rocking the Bondtech at MRRF, and [Martin] has put together a very nice product. Since the beginning of time, or at least since 2010, Wade’s geared extruder has been the standard, low-end extruder for RepRaps and other DIY 3D printers. It’s simple – just a motor mount, two gears, a hobbed bolt, and a few springs and bolts. It’s so popular, there is a digital archeology project on Wade’s extruder. That said, this extruder is heavy, and when you mount that on a moving carriage, you quickly create a wobblebot. The E3D guys were at MRRF this year, showing off a few new advancements including a miniaturized Wade’s they’re using in their new BigBox 3D printer. 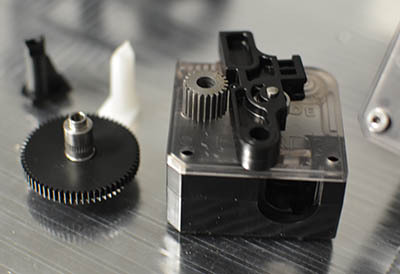 The new extruder is exactly what you would expect from a gear-drive extruder made with injection molded plastic. A tiny motor bolts on to the extruder, and a system of gears drive a hobbed, knurled, or otherwise modified shaft. The E3D guys are doing this right, going so far as to look at the tooth profile of the hobbed driver. This reduces the amount of pressure required to hold filament tight, and gives this extruder exceptional efficiency. At MRRF, E3D was driving this extruder with a ‘pancake’ NEMA 17 motor. Usually, these thin motors are unsuitable for 3D printing applications because they lack the torque required to push filament or move an axis. E3D’s extruder doesn’t need a big motor, and aside from being a little warm, this extruder and motor performed like a champ. Dissolvable filament used as a support material in RepRaps and other 3D printers has been around for a while. Makerbot launched a line of dissolvable PVA back in 2011, but somehow the idea of extruding two types of filament and dissolving one when the print was done never really caught on. Why, we’ll never know. Since E3D has a few different extruders specifically designed for dual extrusion, it only makes sense they would incorporate dissolvable filament into their product lineup. It’s not a pure PVA plastic, either. E3D has come up with a new filament based on PVA that also includes other water-soluable materials like the plastic gel cap medications are made out of. They’re calling this material Scaffold, and from the prints they had on display, it works really well. One problem with dissolvable filaments is how to get rid of the support material. If you’re using HIPS as a support material, you can dissolve it away with limonene, but that means you need to get rid of the resulting goo of dissolved plastic and toxic chemicals. PVA is water soluble, and so are all the other ingredients in the Scaffold material, so the best way to dissolve the material on a print is just to put it in a dishwasher. Although it’s not recommended to put the Scaffold material in the dishwasher quite yet – E3D is still working on certifying the plastic as safe enough to wash down a drain – it is the most we’ve seen from dissolvable filaments in the last two or three years. The resulting prints look fantastic, and from what we’ve seen, two extruders standard may be a necessity in a few year’s time. Because of cross-linking and degradation. What’s cross-linking? It’s the act of PVA turning into carbon in your nozzle. PVA is a tricky material, at the temperature that it prints, it will also cross-link. Meaning if you leave it hot for longer amounts of time, you will ruin your nozzle. This also means your nozzle should not have any resident material buildup. And degradation can help in faster cross-linking. Oh yes. Fun stuff! Add this on top of all the other complexities of printing with different 2 materials. And you have a complex whole to get right. this is also only the tip of the iceberg. plastic injection molding has similar challenges, in essence they function using a large multi kg metal screw with differential heating, where the material is fed in the temperature is barely above ambient and at the nozzle it is at melting or plastization temp, depending on material. perhaps a similar solution might work for deposition printers. Well, because PVA can be problematic, you can also use plane-jane ABS and PLA for your supports. If you want a final piece of PLA, acetone will sufficiently dissolve the ABS as a support structure. It’s messy and somewhat hazardous, but it works. It’s old (2010), but I’ve seen little else on this front. And both ABS and PLA are cheap. When I get my dual up and running, I’m going to try this. I use limonene and HIPS, and I’m not aware of any significant toxicity hazard with limonene. I assume the HIPS sludge is more of a risk. The HIPS sort of settles to the bottom, and I could decant off the limonene and probably either use it again or bring it to my local hazardous waste facility. I bought a gallon and it dissolves so much HIPS that I think I will be able to use it for years. Cool, I had no idea there was a genealogy page for my extruder. I need to make a new one now, and frankly I was getting confused by all the derivatives. A good problem to have.